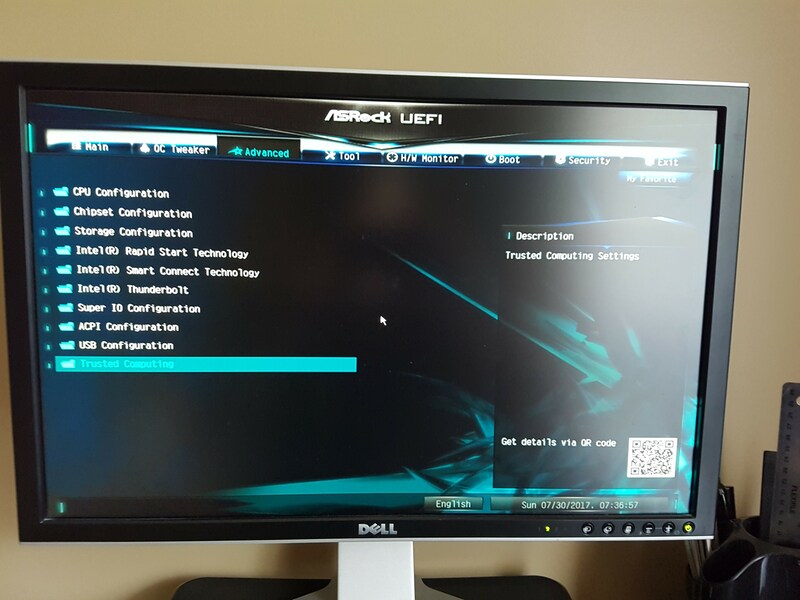 I submitted a technical support request on July 8 with the ASRock website, but have not received a response. I bought the ASRock HA-TPM2-S Nuvoton NPCT650/TCG Compliance TPM Module from aerocooler on ebay. I installed the TPM module in my ASRock H97M Pro4 motherboard with bios v 2.10 (the latest). but the Current Status Information is Support Turned Off remains. When I run tpm.msc, Windows says that the Compatible Trusted Platform Module (TPM) cannot be found on this computer. Verify that this computer has a 1.2 TPM or later and it is turned on in the BIOS. Do you have BitLocker enabled? Did you try connecting the TPM module again? When you submitted a support request with ASRock, did you receive an automated email response that your request was received? Thanks for the reply parsec. I am running Windows 10 Pro. 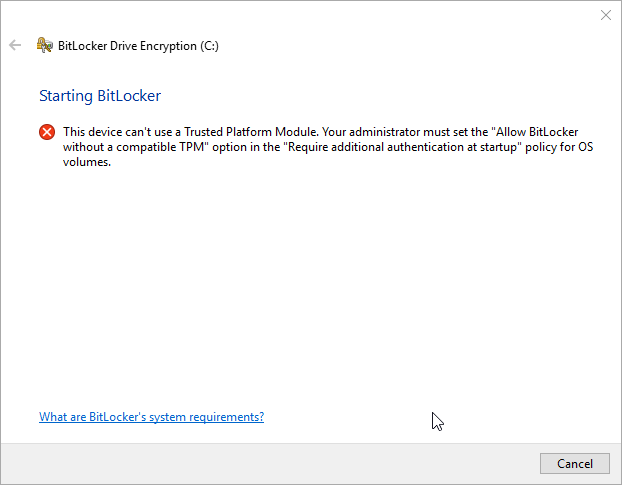 If I go to enable BitLocker, I need to do so with a TPM. When I disconnect the TPM module, in the UEFI, the Trusted Computing option in Advanced disappears. It is only an available menu with the module installed. It must mean that the motherboard is seeing something. I did receive the automated email response from ASRock after I submitted my issue. Any thoughts? Has anyone successfully used a TPM with the H97M motherboard? Sorry, but I've never used this TPM module, so just doing the best I can. I don't see a driver listed for download on the ASRock website page for the TPM modules. A different manufacture's TPM module had a driver disk included with the TPM device. Nothing like that came with your TPM module? Or a user manual? Do you see an entry anywhere in Device Manager for the TPM module? It may be shown under Security devices. Check if the TPM device is working normally according to Device Manager, and if a driver is installed. The Secure Boot option is in the Security screen in the UEFI. You may find that if you enable Secure Boot, that the PC then does not boot. Secure Boot depends upon the CSM option (Boot screen) being disabled. 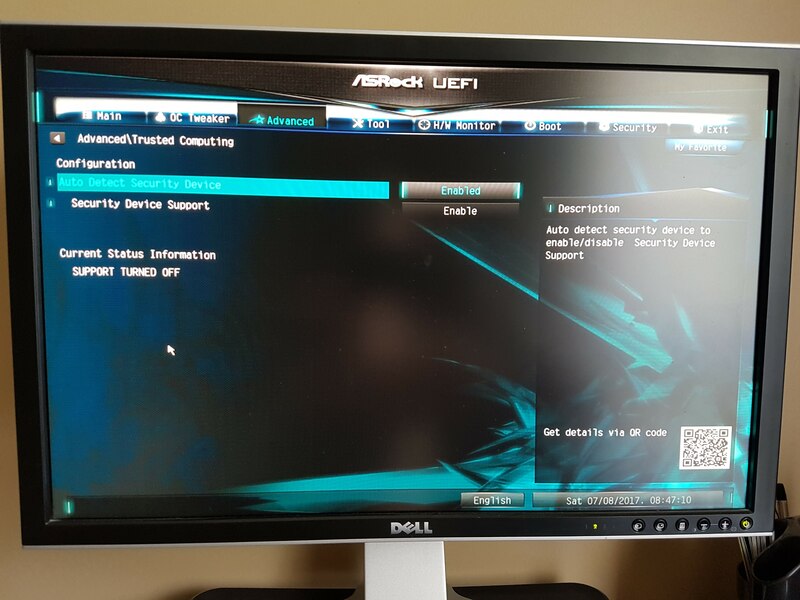 Enabling Secure Boot has disabled CSM automatically in the past in ASRock UEFIs. But when CSM is disabled, that requires a UEFI booting Windows installation, or it has in the past. That is the cause of the failure to boot, if it occurs. Please check the Device Manager entry for the TPM device, and if it is fine, then try to enable Secure Boot in the UEFI. If the PC no longer boots, set Secure Boot to disabled. Let us know what happens and we can try to move on from there. Thank you for choosing ASRock. Please download the BIOS from below link and update BIOS by instant flash. Thank you parsec for your reply. Sorry for my delay. I was on a short holiday. Thank you ASRock TSD. The BIOS below worked and it recognized the TPM module right away. I really appreciate your follow up. I got the exact same problem with the FM2A68M-DG3+. The TPM Module is version 2, from Asrock itself (funny coincidence...!). Is this a known problem and is there a fix? ASRock released a new BIOS that support the v2 TPM module. Submit a ticket and reference this post. Hopefully they do the same for you :)! could you please do the same to the B85M Pro4? I have the same problem and wasn't able to fix it till now.